May 9th is National Drone Day, with events held in cities all across Canada! 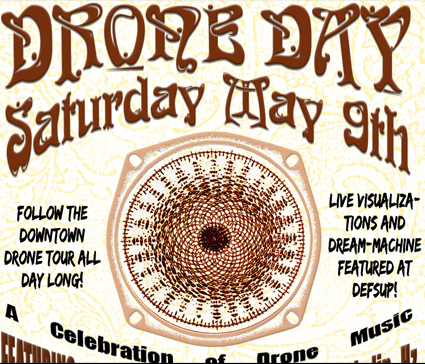 Come out and celebrate local electronic and acoustic drone music all day long on the Thunder Bay Downtown Drone Tour. 12:00 pm – Calico Coffeehouse – 316 Bay St.
1:00 pm – Waverly Park – 401 Red River Rd. 2:00 pm – New Day Records – 15A St Paul St. Ocean City Defender, Pitchslip Hz, Chemical Bank, Beacons, All on my (Ohm), Jacob Vaillant, The Shallow Void, and more! 10:00 pm – The Apollo – 239 Red River Rd. Jacob Vaillant, The Shallow Void, and more! Don’t miss the projectors, live video synthesis, the mystical singing bowl, and Brion Gysin’s Dream Machine at Definitely Superior Art Gallery!